The past two weeks have been truly amazing. 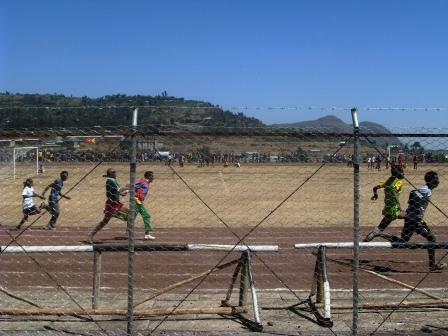 I was given the opportunity to go to Maichew, Tigray, Ethiopia for the Tigray Games. 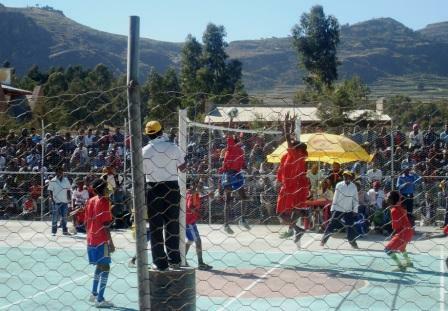 This competition is similar to the Olympics, but instead of different countries competing, every town in the Ethiopian state of Tigray has a chance to get a team together to compete in a variety of different sports. There was no age minimum or limit, simply the best from your town, but a majority of the athletes were teenagers and young adults. Basketball, of course was number one on my list of favorites at the competition. But I also got to watch volleyball, some intense badminton, handball, soccer, races on the track (but some unusual ones!) table tennis, taekwondo, and cycling. I also heard there was gymnastics and chess, haha. The atmosphere at some of these competitions was incredible! Cheers, claps, and chants to support their hometowns (and to diss other towns, of course) were ALWAYS going on. It was very contagious and I couldn’t help but get into the middle of them all. At a few of the events, there was standing room only, with more than a thousand spectators trying to get a peek at the action. Since mid-December, I have been helping a young group of women from Wukro to improve their skills on the basketball court. It has been challenging and frustrating at times, but fun and a learning experience for sure! Sponsored by St. Mary’s College of Wukro, my girls got the opportunity to play in Maichew. There were four other women’s teams playing in the Games. We would play them all, and based on record and points allowed vs points scored they would determine the place of each team for medals. The court was brand new, being finished only days before the competition would start. It was built on the compound of the high school in Maichew. It’s an outdoor, cement surface with movable goal standards. 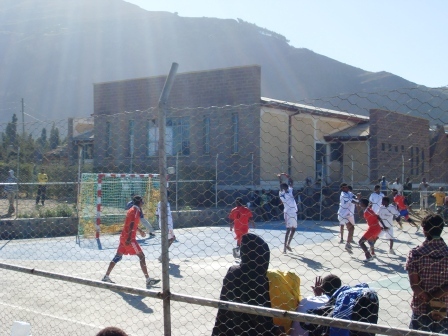 The court was also painted for volleyball and handball. I really had no idea what to expect from my girls, from my assistant coach, the other teams, the referees, scorekeepers, fans. It turned out to be an amazing experience. We went 2-2 over the four day stretch. Although the girls were obviously disappointed when we lost, the smiles, confidence, and pride that they showed when we won is what I will remember forever. We had great support from our town’s boys basketball team, who I have also become good friends with. The amount of handshakes, hugs, and cheek kisses that I received was higher than any number I would ever want to count to. We ended up getting 2nd place, and my team and I all have shiny silver medals to prove it. I seemed to be pretty popular throughout the Games. Walking the streets of Maichew I often heard “Wukro… Basket… ” coming from the locals. I wasn’t the lone ferenji in town though. 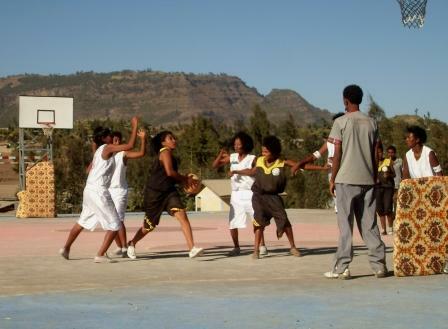 The Mekele girls’ basketball team had a coach who is from London. Her name is Ester, but she said she often got called “Wukro… Basket…” as well because, of course, all ferenji look alike…? 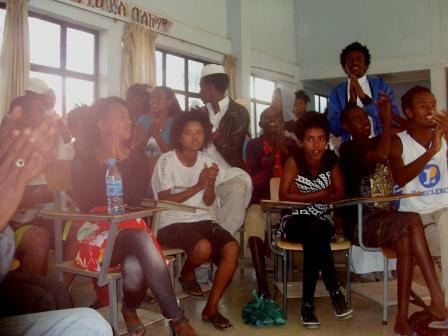 On Thursday evening, I was invited to attend a meeting for the Tigray Basketball Federation. This group is made up of the ‘basketball experts’ from each town, as well as coaches, team captains, referees and other game officials. 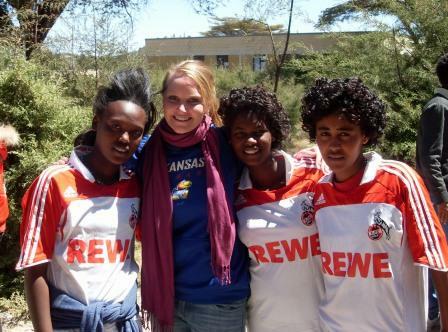 Mekele’s coach and I were the only women in attendance. As if we didn’t stand out enough from the color of our skin, the two of us were summoned to sit up at the front of the room. A few people gave their long winded speeches and in all of them I heard “…yada yada…Bailey…yada yada…Ester…”. Then it was time to give speeches of our own. I knew this would eventually happen tonight, so I had a little something in mind. I talked about how the safety of the athletes should be the main priority and extra measures should be taken to ensure it. For example, sweeping the court, cushioning the metal standards behind the basket, etc. They all shook their heads in agreement, but it obviously didn’t stick. The next morning, a player from Maichew was fouled on a layup and went headfirst into the bare metal standard behind the goal. He was knocked unconscious and was sent to the hospital. Hopefully they learned their lesson. Anyway, the meeting was coming to an end and the “Bailey…Ester” talk seemed to increase. Before we knew it we were up at the front of the room, receiving a framed certificate for our “significant contributions” to the Games. I was really unsure of how I helped more than some other people who received nothing, but I graciously accepted it. The rest of the competition was so much fun! 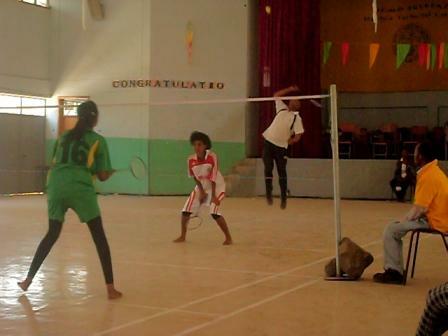 Besides basketball, my favorite sport at the competition was badminton. You wouldn’t believe how INTENSE the games were! Wukro has an amazing badminton team, and they never dropped a match throughout the entire two weeks, it was incredible! I watched the sport of handball for the first time ever. In my mind, handball is a mixture between basketball and soccer, but was so much more physical! It was fast paced with a lot of scoring opportunities. Men’s volleyball is also very popular here. I was really impressed with the skill level at the Games. I didn’t know they made Ethiopians as tall as some of those guys! The funniest thing that I saw at the Games was during the races at the track. The track was normal sized, but made of dirt. They had a BLINDFOLDED 100m, 200m and 1500m race! Can you imagine running in a race without the ability to see?! Crazy! They ran these events in pairs. One of each of the partners put a blindfold on, and before the whistle blew to start the race, the pair grabbed hands, and then they ran the race together. This was entertaining and all well and good until the final curve of the 1500m, when disaster struck. For some reason, the partners were allowed to let go of each other’s hands for the final straightaway. The guy in the lead was fine for a second, but then took a sharp right… right towards the fence! The entire crowd was yelling for him to turn back, to stop, but it was too late. Haha. The poor guy kept coming, full speed, and did a flip over a hurdle that was up against the fence. He landed on his bottom, face into the fence. His partner came and grabbed his hand, and he finished the race, without taking his blindfold off! It was hysterical! I wish I would have had my video camera! I spent a lot of time hanging out with the badminton team as well as the women’s basketball team. They really took care of me and always made sure I was hydrated, fed, comfortable and that I felt loved. Ethiopians are very affectionate towards people they care about. I couldn’t go anywhere without walking arm in arm, holding someone’s hand or having an arm around my shoulder. It took a little getting used to, but the meaning behind it all is just so special it’s hard not to appreciate. I was reading a blog of a friend of mine who is a Peace Corps Volunteer in Maichew. He was talking about much he loves Ethiopia. And that’s when it hit me. I LOVE ETHIOPIA! But I think what is even more special is that I feel like Ethiopia loves me too! Two weeks after the Games had started, we finally returned to my town of Wukro. It felt good to be home again. The morning after we returned we had a small awards ceremony at St. Mary’s College. The cycling team, the women’s basketball team, and the badminton team, who were all sponsored by St. Mary’s, were there to present their medals and trophies and to say thank you. Towards the end of the ceremony they brought out a small, wrapped gift. I heard my name and tried to follow the speech that was given in the local language of Tigrigna. They called me to the front and presented me with a gift of a traditional Ethiopian scarf to show their appreciation of my support and kindness throughout the competition. It really was the icing on top of the cake to end a fabulous two weeks of sports, friendship, and love. Just as my landlord promised, I was given (finally) an extra small room to use as my kitchen. This day was long overdue and much anticipated. The week after Thanksgiving I was allowed to move my things into the small room across the compound. Thanks to Kevin for helping me move all of my stuff! I was so excited about this and was very proud of the way it looked with everything in it. The next morning, I walked into my new kitchen and noticed some small black dots on my stove. Rat turds, I thought, although I tried to talk myself out of the fact that there had been rats in my kitchen over night. But I kept coming across more evidence that there had been an invasion while I was sleeping. And it was disturbing! I finished making breakfast for myself and took my food into my bedroom to eat. Later on that day I walked back over to wash dishes. I use three shallow basins for dishwashing; one with soapy water, one with clean water to rinse, and one to set my dishes to dry. I put the basins on the ground and sit on a small stool. As I’m washing the dirty dishes from my morning meal I notice a few rat turds on the table underneath my stove. THEN, I noticed something hanging down, coming from up inside my stove. THEN, IT MOVED! I did the “slow motion, get up and move backwards” maneuver away from the table and out of the kitchen door. I collected myself then gained the courage to take another look. Yes, it was definitely the TAIL OF A RAT! I didn’t think I was scared of rats, but maybe that’s because I’ve never had an encounter with a rat. Sure we have a few field mice in Kansas, but those are different… you should have seen the TAIL on this thing! YUCK! I wasn’t really sure what the next step was, all I knew was that I didn’t want to go back in there until the rat was gone! So I called the police. Ok, so I really just walked over to the door of the policeman that lives in my compound and asked if he had a minute. He took a look underneath my stove, confirmed what I already knew, then went and got the one-eyed cat that hangs around my compound. Haha. He and the cat went into my kitchen and he shut the door behind them. There was some scuffling coming from inside. The door opened and out ran the cat, with the rat in its mouth! Over the next few weeks, it was a constant battle; a losing battle at that. I was completely paranoid every single time I opened the door into my kitchen room. I didn’t even want to go in there. I thought about moving my things back into my bedroom where they had been before, but I host a lot of PCVs that live nearby and I liked the extra space I now had. I moved most of my food out of the room, back into my bedroom, and put my dishes in plastic, stackable baskets that were easy to move in and out of my kitchen. I had a pretty good system for keeping the rats out of my food and off of my dishes, but they still invaded every night, and left LOTS of round, black evidence. And I was still paranoid. I was telling a teacher friend about my problems with the rats. He said he knew a guy that sells live rat traps. I thought it would be worth a try. Turns out, they don’t work very well………at all. So I found a friend with a snapping trap, like the ones you would normally see in the States. But what I didn’t know is that I was dealing with ninja rats! Night after night I set that darn trap, and EVERY time, they would just eat the veggies, crackers, or peanut butter right off of the trap, without setting it off! I was dumbfounded. I didn’t know what to do. A couple more weeks went by without catching any more rats. The first week of January I had to go out of town for 3 weeks. I tried to move everything they could get into out of my kitchen into my safe bedroom. But still, I dreaded the day I would return to see the damage that would be done and the mess that would be left for me to clean up. Sure enough, after my 3 week absence, it looked like there had been 100 rats in my kitchen every night. The damage done was absolutely unbelievable! They had chewed through entire plastic lids! They got through two plastic baggies and into 4 packets of hot chocolate mix. There was cocoa powder everywhere! The amount of rat poop was disgusting and disturbing. The family that lives with me in my compound said they had been setting the trap every night and caught FOUR while I was gone!!! This was great news! But FOUR RATS?! Which brought my total to SIX RATS… UGH! 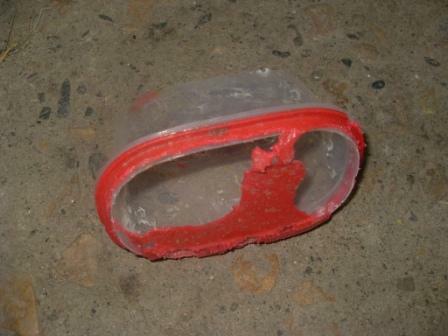 That night I set the snapping trap and put some peanut butter in and on the live trap that was still useless thus far. The next morning, I walked across the compound and slowly opened the door to get a peek in. The first thing I noticed was no rat in the snapping trap. Go figure. BUT! 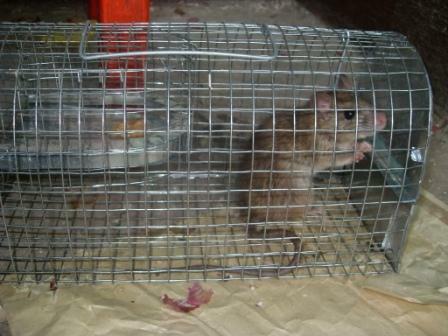 I FINALLY CAUGHT A RAT IN THE LIVE TRAP!!! I could hardly believe my eyes!!! It finally worked! I was so excited! The first thing I did was run back into my bedroom to retrieve my camera, haha. The rat was as big as I expected, and the long, thick tail was just… gross! After the photo shoot I went over to my compound dad and asked what I should do with the nasty little creature. He said we would wait around for the cat. That was fine with me! That afternoon I went to basketball practice. When I returned, the rat was gone! I asked the compound dad what he did with it, if the cat had finally come around to finish him off. He said “Dumu yellen (there is no cat), karrar (knife), anchuwa (rat), DEAD (and did the ‘slit your throat’ motion, haha!). That works for me! As long as I didn’t have to see it! I took the time to really get things cleaned up. I bleached everything in the kitchen and swept up a ton of cocoa powder and rat turds. I figured if I got everything cleaned up real well, I would be able to tell if more rats were still coming in. The next few mornings were just as successful. No evidence of any nighttime rat invasions. I’m now going on about 2 weeks of being ‘rat free’ and it feels so good! 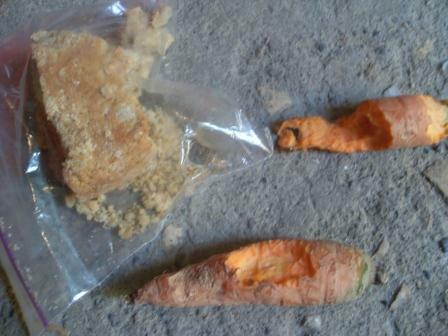 No more sweeping feces, no more wasted food, no more paranoia, NO MORE RATS! Later on that day they put on a coffee ceremony for me, and we ate cake. Kevin came by to help celebrate. They all (kinda) sang “happy birthday” in English. Thanks to all of you who wished me a happy birthday via fb, skype, snail mail, etc. It really was a happy birthday! My favorite holiday, hands down. And no, they do not celebrate Thanksgiving in Ethiopia. 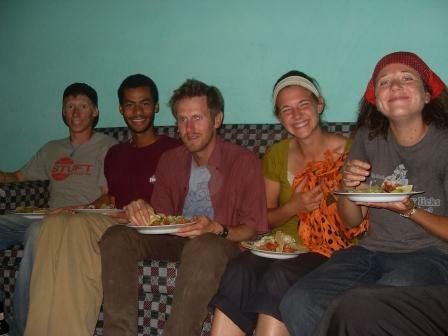 After lots of list making (I like lists) and text sending we figured out that it would be possible to have a somewhat traditional Thanksgiving dinner in Ethiopia! We decided to spend this American holiday in my town of Wukro. We had PCV friends travel from 4 hours away to celebrate with us! It took a lot of work (and a few care package items from America), but we were able to create a fantastic, tasty spread of American holiday deliciousness! Dinner included meatloaf, fried chicken, mashed potatoes and gravy, stuffing, green beans, salad, jello, no-bake pumpkin cheesecake and apple pie! We had an AMAZING Mexican Fiesta dinner! Complete with homemade everything! 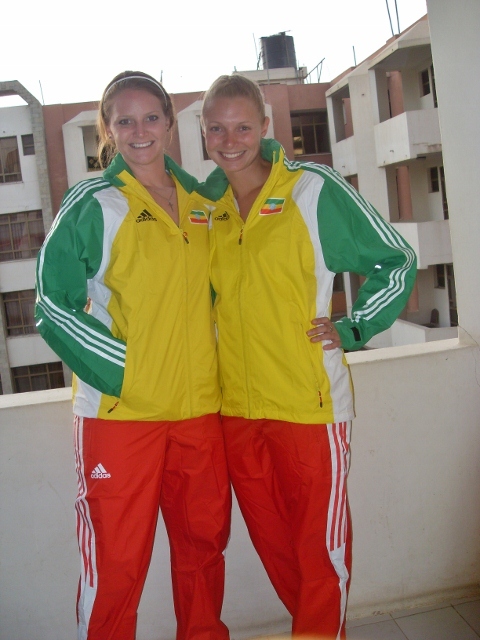 My friend Allison and I broke our banks and bought legit, Adidas, Ethiopian Track Suits! Well worth the 950 birr to look so cool! Peace Corps Programs in various countries allow Volunteers to purchase a bicycle if deemed necessary for their work. Ethiopia happens to be one of them! 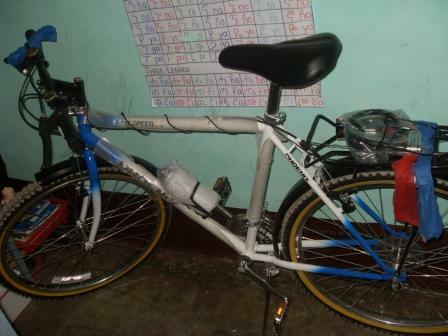 PC Ethiopia gave me a stipend to purchase a bike, and so I did just that! My bike is so cool… It has 18 speeds, lots of reflectors, a light, blinkers, a water bottle, a bike lock, and a rack on the back to secure my books and papers (seriously)! 😛 And on top of all fancy stuff, its blue, my favorite color! So I was kinda nervous to ride it around. I mean… there’s LOTS of big rocks, thick sand, oxen, donkeys, goats and sheep, and of course, children wandering around all over town. But I finally got on and gave it a shot on my way to pick up a live rat trap (rat story to be continued…maybe its own blog post). As I began to ride it I noticed that my tire was flat! How could my tire be flat if I JUST bought it?! I found a bike shop on the side of the road, and the nice old man pumped air into my tire and I was off again. The next day my tire was flat AGAIN! I walked it to the nice old bike repair guy, he took the tube out of the tire in record time, patched up a hole and before I knew it I was on my bike, testing it out. Turned out there were lots of holes in the tube. So I had to buy a new tube. I didn’t mind, the tube wasn’t too expensive, but I wanted to give the guy who sold it to me a hard time about selling me a bike with a faulty tube! 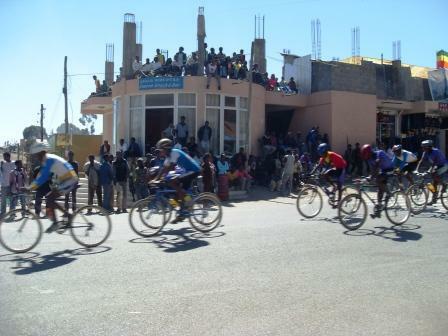 When I went to Mekele a couple of weeks later, I told the bike shop owner about it and his response was “Yeeeeah, it’s from China” …. Haha. Oh well! 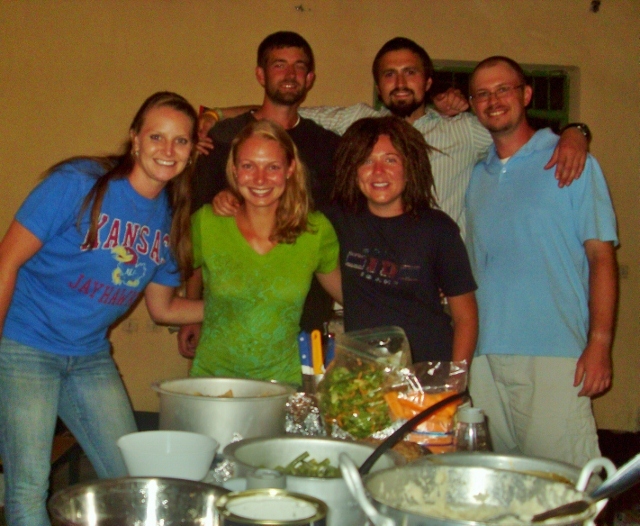 So I don’t think I’ve ever mentioned this before, but Peace Corps Volunteers are awesome! Just when you think you’ll get sad and lonely on Christmas Eve because you’re not in Salina, KS at grandma and grandpas house eating pizza and soup after the 4 o’clock Mass, 13 Volunteers show up to your house and start making Mexican food! 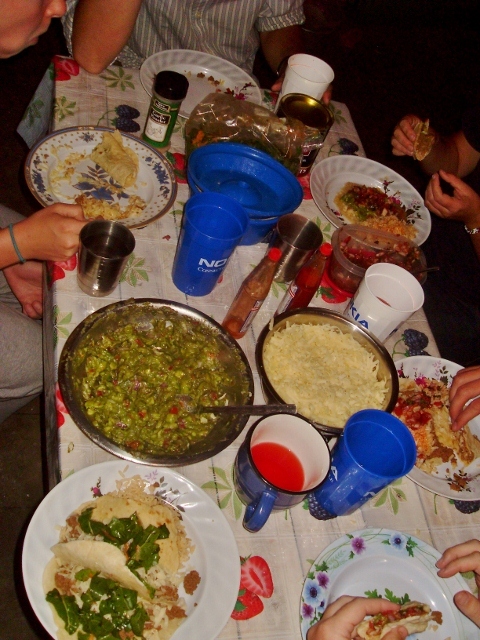 We had a fantastic spread of homemade Mexican food… wheat and white tortillas, meat, beans, rice, guac, salsa, cheese!!! We all sat around in my compound and played charades afterwards. We ended the night with a sleepover. I had 4 friends stay with me. We watched Home Alone as we fell asleep. It was great! Christmas day started early, as usual, but in a not so usual way. We got up and went to play basketball… outside! Since its 85 degrees and sunny here, every day, what better way to spend Christmas morning, by doing what makes me the happiest! After a few pick-up games with a mix of Americans and Ethiopians, we decided that it was time to get busy cooking and baking. But first, we had muffins for breakfast. Thanks to Aunt Sue for the blueberry and cinnamon muffin mixes and the ingredients and recipe to make Grandma’s pumpkin bread! 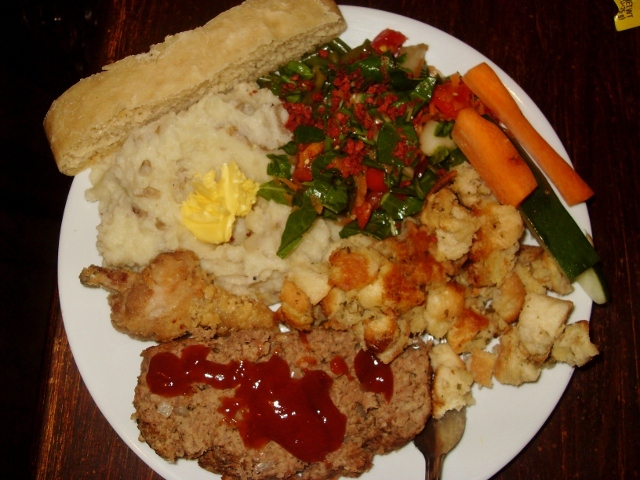 Anyhow, we had a fabulous Christmas Dinner. Meatloaf, mashed potatoes and gravy, stuffing, salads, mac and cheese, green beans and carrots, and various desserts ended up being waaaaaaay too much food for the 14 of us. We all stuffed ourselves until we were uncomfortable, it was awesome! 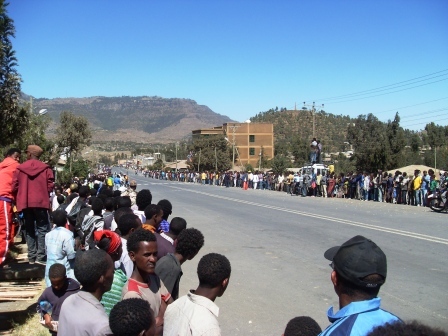 We decided that Mekele, the big city 45km south of my town, was the best place to celebrate the New Year. We followed the usual pattern of getting into Mekele, eating ferenji food, walking, eating, walking, and then more eating. 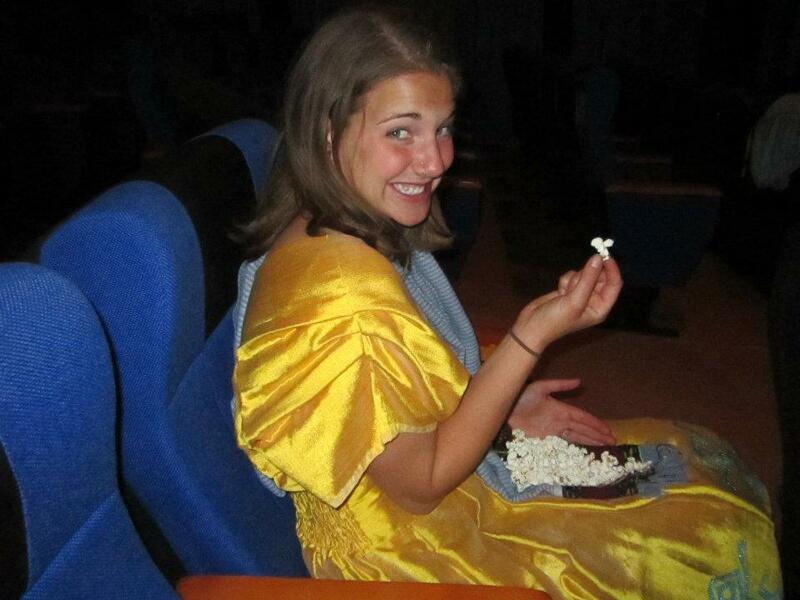 In the middle of one of the walking bouts, we stopped in at the movie theater. On a previous trip to the city, we stopped in to check it out and made friends with the owner. He is an Ethiopian man that lived in Boston for 25 years before returning to Mekele. He offered to show a movie for us, for free, to help celebrate the New Year. We took him up on the offer and returned a few hours later to watch the movie “Red”. We were given free popcorn and had the theater all to ourselves! It was easy to forget that we were in Ethiopia. After the movie, we headed over to an indoor/outdoor bar. We celebrated in a way that any group of Americans might. The bar owner surprised us with a couple of bottles of champagne. Have I mentioned how kind some people in Ethiopia can be?!?! Free movie, free champagne, sheesh! We all had a great time! The start of a 3 week ‘vacation’ from my site. Diane, Ally and I hoped on a plane, headed to the capitol city of Addis Ababa. 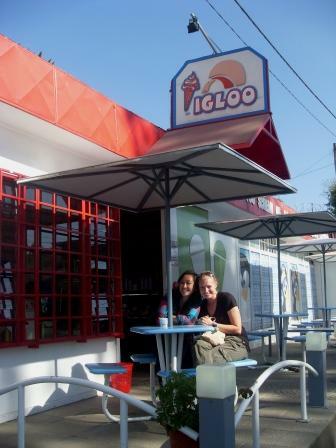 We hung out in Addis, ate waffles, burgers and ice cream and spent a lot of money. Since the Ethiopian calendar is weird, their Christmas falls on our January 7, which is their January 29th. 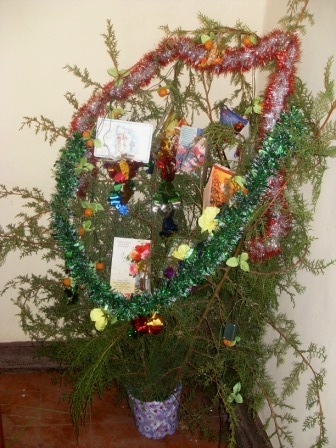 A few weeks prior to Ethiopian Christmas, I received a call from my Host Father down in Assela. Assela is where I lived for 10 weeks with a family during Pre-Service training and to get introduced to the ways of Ethiopian culture. He invited me to celebrate Christmas with them. I told him that I would come, but I don’t think they believed me. Being back ‘home’ was like I never left. I tried to help with the chores and cooking, but they insisted that I go take rest, that I must have been tired from the traveling. I rested for a bit, only to please them 😛 but after my nap I jumped in on my host sister, Betty, while she was making cookies. We made a bunch of the fried cookies that I fell in love with while I lived there. We listened to music on my iPod, and then she introduced me to a few new Justin Beiber songs she had on her mobile phone, haha. As soon as I woke up, I got online and got in touch with my family back home. We decided that it would be cool to skype, so my Ethiopian family could meet my real family! It was so cool to introduce them to each other! Christmas Day was, surprisingly, very relaxing. My host parents and sister didn’t seem to work too hard. We went over to my PCV friend Daniel’s host family’s house for lunch. My family was VERY pleased to see that I could now eat Ethiopian food! Throughout the day we watched EthiopianTV, where they showed the celebrations of the different regions and cultures of Ethiopia. 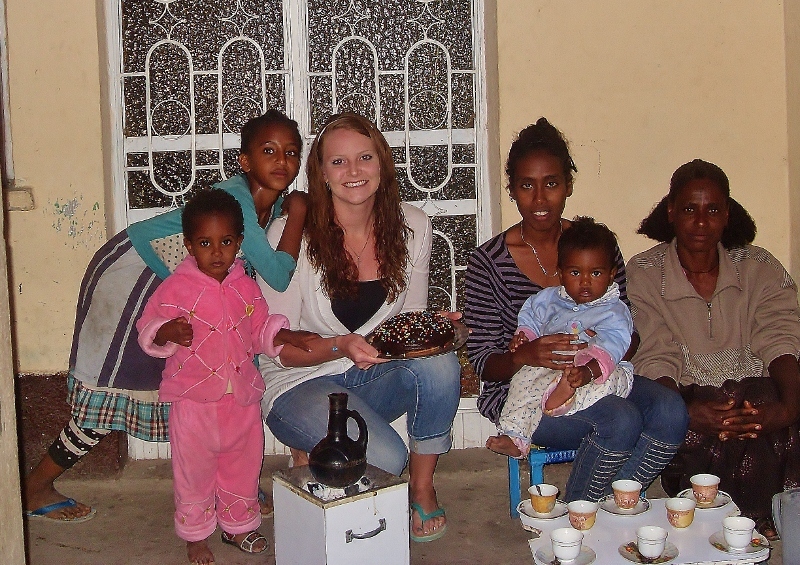 I gave my host family a few gifts like games, lotions and honey from Tigray! We had supper at my house with a few family friends and had coffee ceremony, of course. That night, my sister and I watched a movie on my laptop, just like we did when I was there months before. I left on Sunday morning. It was sad to leave them again, but I assured them that I would be back sometime! I hopped on a bus and headed back to Addis. When I returned, I was reunited with all of my Education Volunteer friends. It was so great to see everyone after 4 long months at our own sites. On Monday morning, we would all head to Ambo, Ethiopia for our In-Service Training. More details on that to come! Hope you are all doing well and having a good Fall season. It doesn’t seem like Fall here, considering the heat and sunshine, but I LOVE IT! I’ve had a few requests to share pictures of my town, so here you go! Enjoy 🙂 Have a wonderful Thanksgiving, God Bless! I thought I’d let you all in on what’s been happening over the past month or so. The Monday before school would finally start on Tuesday I got a gall bladder infection. Typical Bailey right there. Here I’ve been bored out of my mind, waiting for school to begin, and when it does I go down and out for 5 or 6 days. Anyway, I was picked up in a Red Cross ambulance and taken to the local hospital, the Drs did an ultrasound and a chest x-ray and diagnosed me with a gall bladder infection. They gave me a few meds, and I was headed back home, still in lots of pain but with what I needed to get better. The next few days were rough. The infection made me feel really sick so I was rarely out of my room, but when I was everyone would ask “Ishi ki?” (Are you ok?) I got lots of visitors from the school and lots of calls from my doctors making sure I had food and water and was doing alright. So I recovered from that, and the next Monday I was on the job! I finally met the right person who would be able to help me get into ALL of my 5 schools. He works at the Woreda (district) Education office, and works with all 5 of my primary schools, along with the Secondary School (grades 9 and 10) and the Preparatory School (grades 11 and 12). He took me around town to get familiar with each of the campuses and to meet the directors of the schools. Everyone seemed excited to work with me; that was encouraging. The next few days I spent devising a plan of action and some documents I would use for observations and interviews. On Ethiopian New Years, I met a guy who works for another Woreda that includes all of the 80+ village schools that surround my town. He is in charge of putting on trainings for teachers, so he asked me if I would “help” him with a methodology training he had coming up. I said I would. It took a lot of prepping to put together, but when Sunday rolled around I was ready to go. He said he would be by at 1half (7:30am) to pick me up and the training would start at 9. He showed up at 8:10, we had coffee with a lady in my compound, and were finally out the door by 8:30. The ride out to the village school took about 40 minutes, but I wished it had taken longer. The driver was going way too fast through the mountains on the terrible dirt roads and it was freaking scary, lol. The teachers were coming “by foot from the villages” so the training didn’t get started until after 10. We finished up at about 4 after taking an hour break for lunch. It didn’t go as well as I would have hoped, but it went better than I had planned. I learned a lot, and the teachers said they did as well and would like me to do more trainings for them. When I got home, I was exhausted. I popped some popcorn and crawled into bed and started to play Monopoly on my iPod. A few minutes later I got a knock on the door. It was the Principal of Selam Primary, my main school, saying we had a program to go to… I said ok, and we were out the door. I am basing my observations on the Ethiopian Ministry of Education’s English Language Competencies for English Teachers. This includes creating a positive environment, managing behavior, activating prior knowledge, using a variety of assessments, using many strategies to include all students in the learning process, using listening, speaking, writing, reading, grammar and vocabulary for the acquisition of English, and more. I have been more than welcomed into the schools I have been into so far. Most of the teachers want to know immediately after the lesson is finished how they did and what they need to improve on, although that is not what these observations are for just yet. It is encouraging to knnow that they know the yneed to improve and that they WANT to improve. But for now, I am only collecting data to see where the gaps and needs are for a majority of the English teachers in my town. Based on these observations, later down the road, I will put on trainings, workshops, set up a model classroom and teach model lessons for the teachers to help them improve their English teaching. I often find myself sitting in a café for a couple of hours late in the afternoon with my Peace Corps Volunteer friend, Kevin, talking about things we can’t have, like bacon (my mom actually made possible!!! ), doughnuts, tv’s with American Football and running water. Last weekend, Kevin and I tagged along with a few administrators from the school out to a nearby village for a gigantic Ethiopian Orthodox Christian celebration. There were thousands of people there. We were in the village of Abara Hatsbera, which is one of locations of the famous rock hewn churches of Tigray, Ethiopia. We watched horse races, nearly got trampled by a hoard of Ethiopian children who were being swatted by big sticks by the crowd control army, got sweet visors commemorating the event, and saw some beautiful scenery from the hill which the famous church sits. I have had a lot of fun with the children that inhabit my compound. I have posted quite a few pictures on my facebook page. 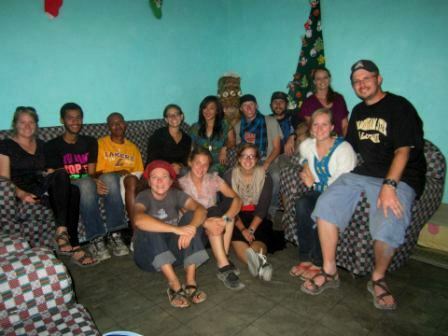 Check it out by searching “Baileys Peace Corps Experience” on facebook! I learned a few weeks ago that my town is getting an Environmental Volunteer in December when they finish training. I am super excited about it, and should know who it is in the next few days! I can’t wait to show him or her around town and share all of the fun facts about my town, like where to buy flour, oranges and pots, where to sit in the afternoon for a drink, and who to know that will invite you to drink tea every time they see you around town. Well, I suppose that is enough for now. Let me know if there is anything you are dying to know about my experience here. 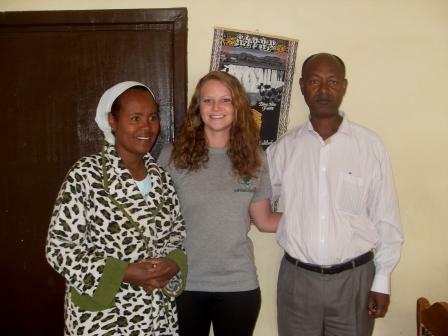 Two and a half weeks ago, I completed my 10 weeks of Pre-Service Training for the Peace Corps in Ethiopia. 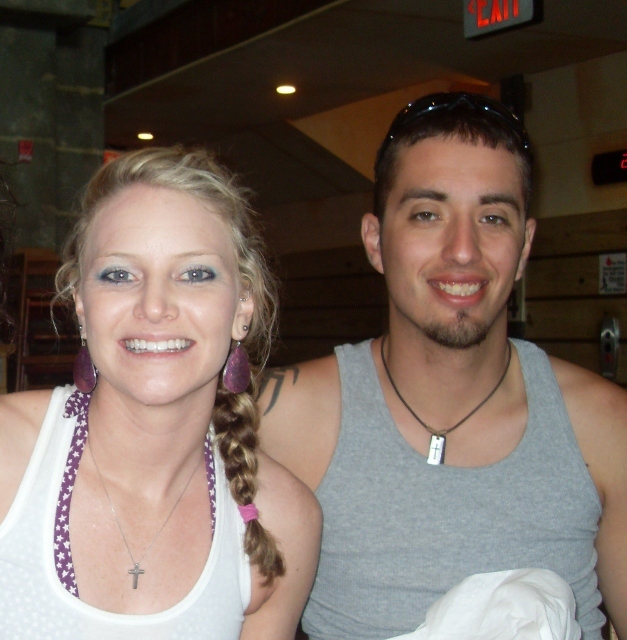 That day seems like forever ago! So much has happened since then. On Friday, August 5th 2011, 69 Trainees were sworn in as Volunteers at the U.S. Embassy in Addis Ababa, Ethiopia. I am very proud to be a part of the 5th Group of Volunteers to come into Ethiopia since the Peace Corps program was reopened in the country in 2007. I am also a member of the first group, since reopening, to swear in every member that they started training with! 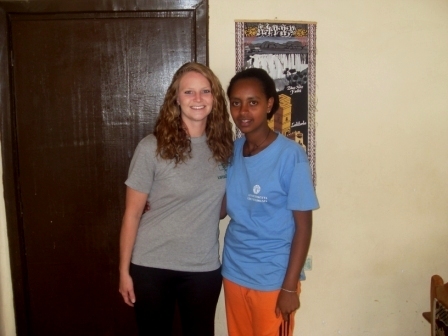 ALSO, I am a member of the FIRST group of Education Volunteers to come into Ethiopia in 25 years! Over the weekend, me and my fellow Volunteers made our way around Addis in search of Western style FOOD and household materials that can only be purchased in the capitol city. Items included non-stick frying pans, spatulas, cotton sheets, stoves, adapters, western style food and much more. I purchased an electric kettle to minimize the time of boiling water, a non-stick frying pan, pot holders (not folded up sheets of computer paper that my host family used as pot holders), and a 3 burner propane stove. We also got a tour of the Peace Corps compound in Addis. We all raided the Volunteer Resource Center in search of good books to borrow. On Sunday, August 7th, 68 newly sworn in volunteers took off in busses and vans in the direction of the permanent sites. One got left behind in Addis… that one was me. I was pretty bummed about not going to my site with everyone else in my group, but I needed to stay in Addis. 6 weeks ago, I strained a muscle in my back. The muscle swelled up pretty big and was putting pressure on the nerves of my spine causing a shooting pain down the back of my left leg. Since then I had been on medication for the pain and to contain the swelling, but it was not healing properly. So I “got” to spend a week in Addis to attend physical therapy every day. On Sunday I sulked around the hotel, taking full advantage of the free wireless internet that King’s Hotel in Addis has. On Monday I scheduled a massage at a fancy place in downtown Addis for some pain relief. I navigated Addis by myself and only felt lost once or twice 🙂 the massage was incredible. It was the most professional massage place I’ve ever been to in my life. After the massage I got a glass of lemonade and it was kind of cold! That afternoon I switched hotels to where some Volunteers from Group 2, 3, and 4 were staying for meetings and that is near to the Peace Corps office. During my week in Addis I was able to relax in between my everyday trips across Addis to the hospital for physical therapy. The other Volunteers let me tag along on their outings to get ‘ferenji’ food 🙂 We went to a pizza place one night. I had a chicken gyro that was delicious! We went to Paradise Café and I got a BBQ steak Sandwich with fries, again it was delicious. The hotel we were staying at had complimentary breakfast and I took advantage of that, ordering an “American Style Pancake” almost every morning. On Wednesday evening, I made my way to the Piazza District of Addis and met up with about 12 other Volunteers at a Jazz Bar. I ordered a steak salad and it was to die for. Later in the evening they began to play some awesome jazz music. The saxophone was incredible! The guys on the drums looked like they were having a blast. It was very fun. Later on, a famous Ethiopian singer, Zeritu, came on stage and sang! She sings a very western style of music and even covers some American music, translating it into Amharic. During all of this great music, a message was telephoned down the line of people sitting on my side of the table. The message was to me from Emily, a current Volunteer. She said, “Hey Bailey, You’re Not in Kansas Anymore… I’ve always wanted to say that!” It was as fitting as the original line said by Dorothy to Toto when she wakes up in the Land of Oz. My week in Addis turned out to be really great. I got to know quite a few Volunteers from other groups, ate some great food, got to know Addis and how to get around it, and I got to RELAX! I watched all of Season 1 of “Community” on my computer, took warm showers, and listened to the wicked thunder of the Ethiopian rainy season. On Sunday August 14th, I got in a cab and headed for the airport. I made my way to the gate and waited for hours, as my plane to Mekele was delayed. Finally, I boarded and made the hour long flight up to Tigray. My counterpart from Wukro was in Mekele taking summer classes at the University, so he came to the airport to help me make my way to the bus station. Along the way, we stopped so I could buy a phone card. I went into the “suk” and asked the kid for a 25 birr, green mobile card .. all in Tigrigna! He looked very shocked that I was speaking his language. He rattled off something to my counterpart. “I admire her!” my counterpart later translated to me. It was nice to finally get to speak the language that I had been studying for the past two months! I met my friends, Brittany and Diane, at the bus station and had a short reunion with them before I took the front seat of the minibus in route to Wukro!